Flowering Date: Mid spring to early summer. Lamium grows well in shaded to partially shaded to shaded areas, making it perfect for planting along the edges of woodland gardens or as a transition from one shade garden area to the next. When planted with spring-blooming bulbs, its colorful leaves hide fading bulb foliage. Ships in 3" pot. Lamium maculatum 'Ghost'. Flowering DateMid spring to early summer. Planting InstructionsDig a hole large enough to spread out the roots without bending them. Winter CareHardy. No special requirements. Flower FormClusters of 'snapdragon-like' flowers along the top 1/2 of the short sturdy stems. Foliage TypeBroad, oval, silver-white leaves with greenish edges. Soil RequirementPrefers well-drained moist soil, but will grow in drier conditions. PruningRemove spent blooms to keep the plant tidy. After flowering. Additional InformationPrefers moist, well-drained shaded areas, but also does well in drier spots. 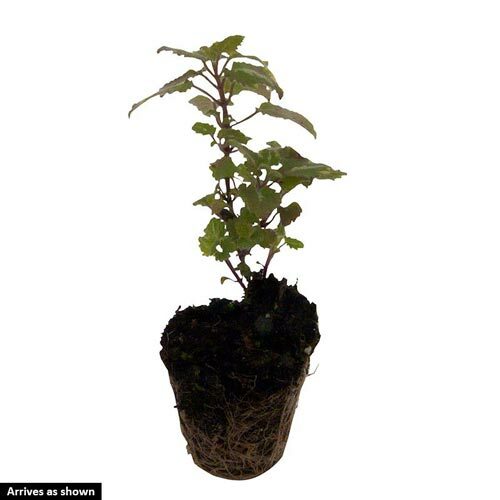 In drier areas, its habit may open up a bit and get a little leggy, and not stay as dense and compact. Unique CharactersticsThis very large variety dwarfs other lamiums by comparison! Standing about a foot tall, the all-silver leaves create a billowy cloud of silver in the garden. The leaves measure a full 1.5 inches long compared to 1/2 to 3/4 inches long on other varieties.Clusters of large, bright orchid purple flowers top the clump of silver foliage in mid to late spring. 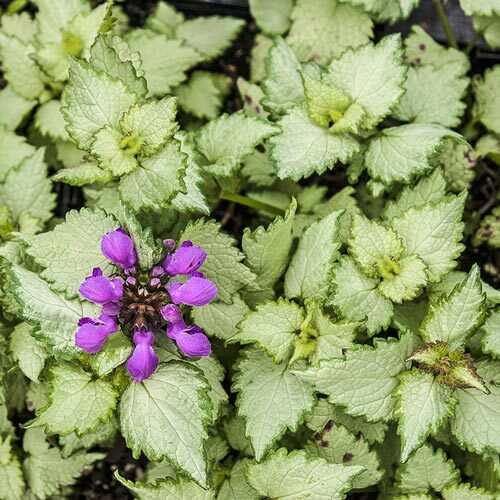 The contrast between the flowers and foliage is striking and often stops passersby in their tracks!Lamium makes an excellent, weed-smothering groundcover and is also a good mask for dying bulb foliage.